Thread: Clouds or Stripes for Backing? I'm going to use one of these two fabrics from my stash on the back of this baby quilt with Scottie dogs. Which do you think looks better?... the clouds on the left or the stripes on the right? I like the stripes. They coordinate well with the top. I also like the stripes - it would also make a great binding for that top. Stripe backing for me and hopefully you have enough to cut bias binding out of it too. The stripes are a perfect backing for the Scotties. Stripes. The doggies are so cute! I vote stripes as well; from the picture the stripes seems to have similar colors and blend well with the Scotty Dogs. You won’t go wrong with either one though for a backing. The stripes look like they were made for this quilt! It's going to be so cute when done! The stripes definitely match color-wise, so if the quilt were for me I'd say stripes, but I wonder if a wee one would rather have the clouds? Sorry, that wasn't very helpful was it? That's darling. I also would opt for the stripes but your idea of using both is a good one. It's going to be a wonderful quilt no matter what. I LOVE striped bindings, especially if the stripes are on the bias. This plan gets my vote. I would use the stripes and use the cloud fabric for a different quilt. The stripes are perfect with the quilt. 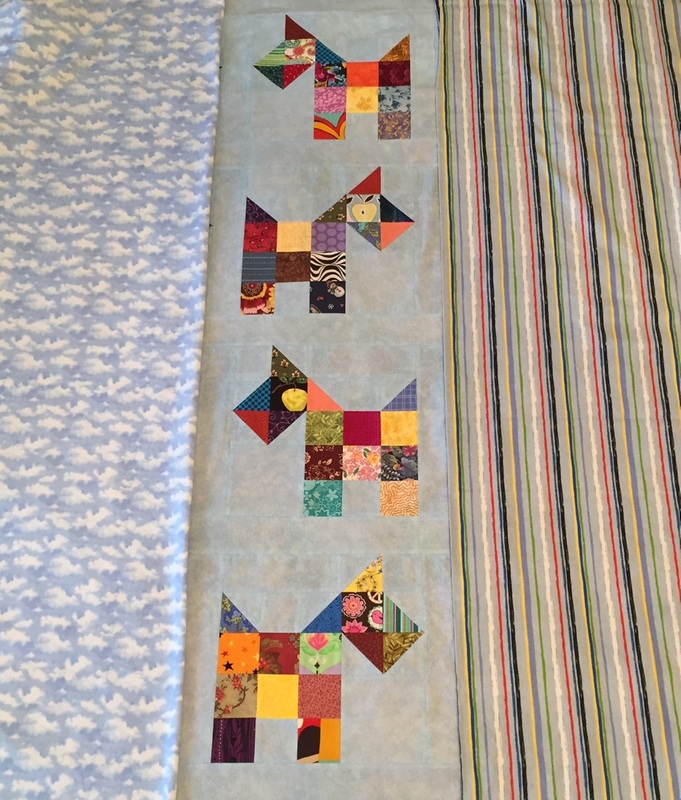 Will you be binding the quilt with the backing fabric as well? I think it will look terrific! I’ve heard that babies see bright colors better. I like the stripes personally. Good point...if I'm not mistaken black and red are the best colors they see at and early age. It's going to be darling! My vote is also stripes. I also go for the stripes. Doggies are very cute. I love the stripes, they go with the top fantastically. I would have gone with clouds as it is for a baby but I think stripes wins it! Looks as if your answer is "Stripes". Go for it and have fun, it's going to be a super cute quilt!